Whitwell's Hudson Petty (31) goes around the left end to score the winning touchdown during Friday night's TSSAA Class 1A state quarterfinal against South Pittsburg. The host Tigers won 34-28 in double overtime. 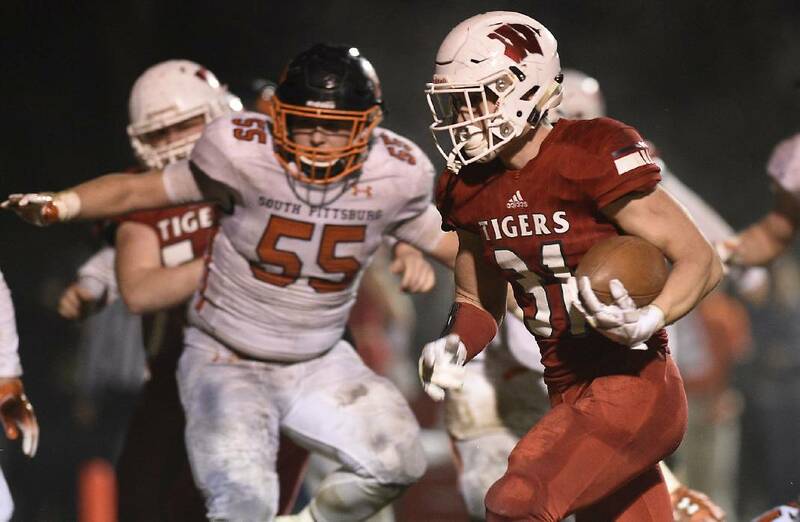 WHITWELL, Tenn. — With the game's outcome — and the weight of an entire community's hopes — resting on his shoulders, Hudson Petty stepped up one last time Friday night. As soon as Whitwell's senior all-state athlete saw a mass of bodies clogging up the middle of the football field, he cut back to his left and outran the defense to the corner of the end zone. Petty's 10-yard touchdown run lifted the Tigers to a dramatic 34-28 double-overtime victory over county rival South Pittsburg in a TSSAA Class 1A state quarterfinal. "I saw everything fold in the middle, and I just tried to make it to the outside where I would have some room to run," Petty said. "We just had to keep finding ways to make plays. My teammates all stepped up, and everybody came through with some big plays to get this done." Whitwell (13-0) will host 2017 state champion Greenback (13-0) in next week's semifinals. The Cherokees won their quarterfinal 35-0 over Coalfield. With the win, the Tigers also set a new school record for victories in a season and have reached the semifinals for the second time in program history. They are the first team to beat South Pittsburg twice in the same season since Boyd Buchanan did so on its way to the 2003 state championship. Twice the Tigers rallied from two-score deficits, eventually forcing overtime with a pair of fourth-quarter scores. South Pittsburg raced out to a 14-0 lead and later held a 12-point advantage with less than six minutes remaining in regulation. The momentum shifted to the hosts in the final minute of the first half. After a penalty brought back a touchdown that would have given South Pittsburg a three-score lead, Whitwell put together a seven-play, 74-yard drive capped by Petty's 10-yard scoring toss to Trenton Stockwell on the final play of the half. Petty added the 2-point run, and the Tigers found new life, trailing by only six. Before that drive, Whitwell had been held to 23 total yards and had committed nine first-half penalties. "We made more mistakes in that first half than we've made all year combined," Tigers coach Randall Boldin said. "But that score right before the half was huge for momentum. The kids battled back on that drive, and that gave us a chance." The score remained 14-8 until the Pirates' defense made its second fourth-down stop of the game, opening the way for a 35-yard drive that ended with Garrett Raulston's 2-yard dive into the end zone to set up a 20-8 lead with 5:22 remaining. Similar to its clutch drive just before the half, Whitwell answered right back, this time with a 70-yard scoring drive in just five plays. Warner Ashworth connected with Tanner Stewart on a 17-yard touchdown pass, and Tigers pulled within 20-14 with 4:07 go to. After Whitwell forced a punt, the offense was again clutch, converting two fourth downs before Ashworth hit Stewart once more, this time on a 27-yard pass to tie the game. South Pittsburg (11-2) stopped Petty's run on the 2-point attempt to force overtime. Whitwell held South Pittsburg to just 25 rushing yards on 17 second-half attempts. Raulston gained 110 yards on 26 carries, and on a night when defense dominated for the most part, he was the only player on either side to finish with more than 45 yards on the ground. After both teams scored touchdowns and added the 2-point conversions in the first extra period, the Whitwell defense turned the Pirates away empty on their second possession to set up Petty's game-winning heroics. "There were times where I was a decoy and my teammates were making plays, and then when they called on me to make a play I just tried to step up for my team," Petty said. "We play for each other and we want it more than anybody, so there was no way we weren't going to keep fighting back."